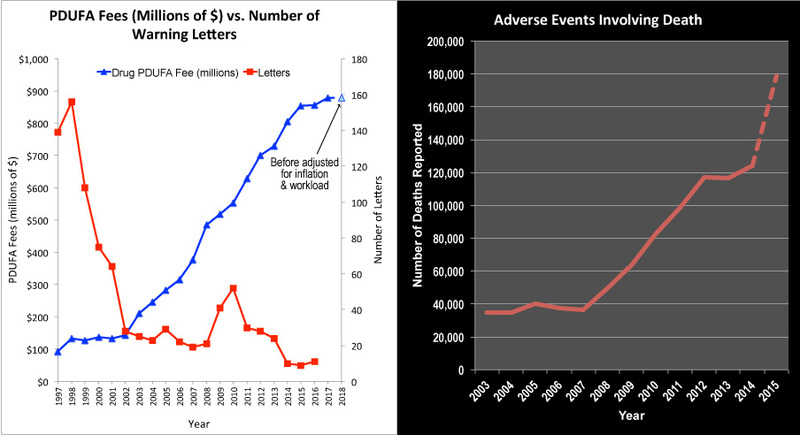 Drug Approval Speed Versus Drug Safety More user fees paid to the FDA by the drug industry and the push for less rigorous scientific proof in clinical trials may lead to faster drug approvals, but also more deaths due to side effects. Where’s the balance between speed and safety? Forged via negotiations between FDA and the various industries dating back to 2015, and racing to beat a September deadline, the bills sequentially increase the amount of user fees FDA can assess for reviewing new products and other integral tasks. In FY2016, user fees accounted for 70% of the drug review budget, 36% of the medical device review budget, 75% of the generic drug review budget and 29% of the biosimilar review budget. Under the draft, prescription drugs would see increases in the base user fee amount from $718.7 million in FY2017 to $878.6 million in FY2018 [before adjusted for inflation and workload]. “I remember there used to be a total taboo to have a candidate with that much connection to the pharma world,” Said Hamburg in a STATnews interview. “In the modern era, having an exposure to how industry works and relationships with industry isn’t necessarily a bad thing. I think it does help to have exposure to different sectors and stakeholder communities. I wish he had a little more public health experience as well. “… I think it’s so important for him to resist the swirling pressures around him – all the politics and competing ideologies – and use science as his guide. I hope Scott will proceed with caution… But I don’t think he’s ever managed anything and [running the FDA] is a complicated managerial task. 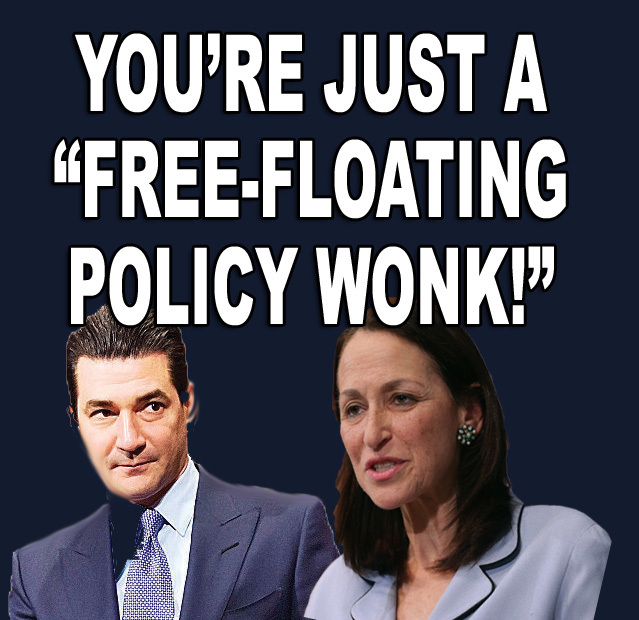 When he was at FDA, he was a free-floating policy wonk and was not running a division. For some time now, I have followed FDA’s pronouncements to the public in the form of press releases and put them into a database. Here is the story they tell to date for 2017. First of all, FDA is saying less. And less. Comparing the first quarter of 2017 with the same time period from 2016, the agency sent out 23 press releases during the first three months, compared to 32 last year. 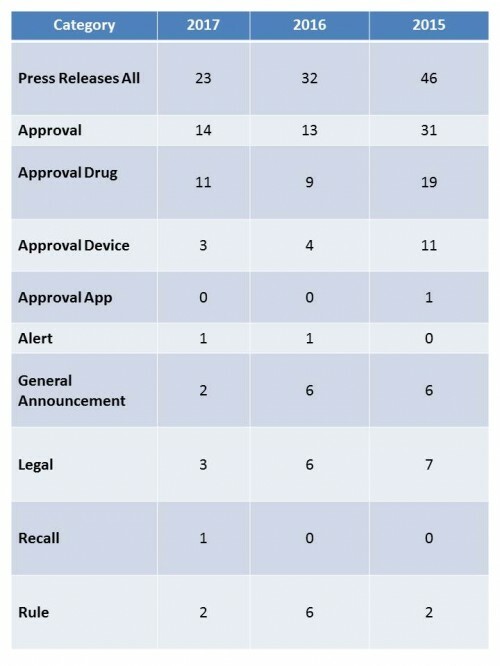 However, if you look at the first three months of 2015, FDA sent out 46 releases during the first quarter, twice the number for this year. So the trend is very much down. When they did talk, what did they have to say? How the FDA Turns Journalist Watchdogs Into Lapdogs – Getting Ready for Trump? To save both millions of dollars AND millions lives, Gilbert’s 3-D printer should create BRAND name drugs as well! Next articleSpeedy Drug Approval Versus Safe Drugs: Can We Have Both?